Differentiating Western and Eastern Bluebirds /Hawks Aloft Inc.
After fielding a number of inquiries about how to differentiate between Western Bluebirds and Eastern Bluebirds, Gail asked me to use my space in this month’s online to detail how to distinguish these two closely related species from one another. 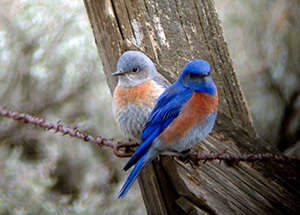 Both species of bluebirds can now be found in the middle Rio Grande bosque year-round, but this was not always the case. During the early 1980’s Middle Rio Grande Biological Survey (Hink and Ohmart 1984), Eastern Bluebird was considered to be an uncommon winter visitor to the bosque and Western Bluebird was considered a rare visitor to the bosque between October and March. By the time we started our Middle Rio Grande Songbird Study in 2004, both species were regularly present in the bosque in at least small numbers during the winter. We began encountering Eastern Bluebirds breeding in the bosque in small numbers during summer 2004. 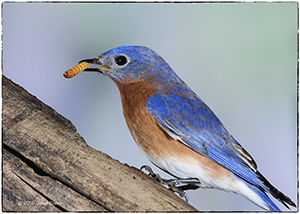 By 2009, Eastern Bluebird had become a relatively common bosque breeder in areas with mature cottonwoods and/or large cottonwood snags. We did not begin detecting Western Bluebirds breeding in the bosque until 2011. 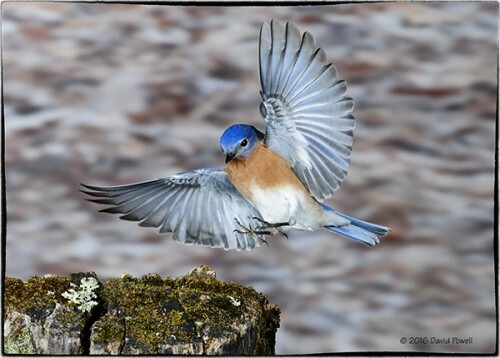 But, Western Bluebirds have also become relatively common bosque breeders over the past two or three years, and may now be a more common bosque breeder than Eastern Bluebirds. Male bluebirds are easier to identify to species than females. Males of both species have dark blue backs, wings and heads, with orange breasts. But, male Western Bluebirds have blue throats, while the male Eastern Bluebirds have orange throats. The orange on Western Bluebirds continues from the breast onto the scapulars (but NOT onto the sides of the neck) and down the back. In some individuals, nearly the entire back can be orange. In contrast, the orange on male Eastern Bluebirds continues from the breast and throat only onto the sides of the neck, with the scapulars and back remaining entirely blue. Another field mark to consider when differentiating males of these two species is belly color (this is often the quickest and easiest way to differentiate these two species). Eastern males have white bellies, while Western males have blue bellies. For those of you with particularly keen eyesight, Eastern Bluebirds (apparently) have somewhat larger bills than Western Bluebirds. The females of these two species are more drab in coloration and more difficult to differentiate. Females of both species have bluish-gray coloration on their backs, wings and heads, as well as faded orange breasts. But, the overall patterns of coloration in females generally follows that of their male conspecifics. Female Western Bluebirds have bluish-gray throats and necks, while Female Eastern Bluebirds have white throats with orange continuing from the breasts onto the sides of the neck. Western females may have some faint orange coloration on their scapulars and backs, which the Eastern females lack. As with males, belly color can often be the easiest way to differentiate the females of these two species: Western females have grayish to bluish-gray bellies while Eastern females have bright white bellies. When I encounter bluebirds in the field, the first things I look at are throat color and belly color. If the throat color is the same as the head color and the belly color is blue (in males) or gray to bluish-gray (in females) then I know I’m looking at Western Bluebirds. If the throat color differs from the head color and the belly is white, then I know I’m looking at Eastern Bluebirds. One final note: During winter these two species may occur in mixed flocks (and on rare occasions may be joined by Mountain Bluebirds) in the middle Rio Grande valley. This usually occurs in prime winter foraging areas with large Russian olive and/or New Mexico olive berry crops (or other vegetation supporting large berry crops). In general, however, these species seem to prefer the company of their own species. Good luck with your bluebirding! I own a 2,100 acre farm/ranch near Weiser, Idaho and have initiated a program through the Treasure Valley Chapter of Pheasants Forever and the Snake River Chapter of Quail Forever to sponsor projects for kids to build and install goose nesting platforms as well as bluebird, kestrel and barn owl boxes throughout the property – which is managed with a heavy emphasis on wildlife habitat. Thank you for the good work you do! It is so important to include children in conservation.